Conrad Manila (Philippines) is a luxury hotel located at the Mall of Asia (MOA) complex in Pasay City, Metro Manila. The hotel opened last June 15, 2016 which marked the entry of the inspired luxury hotel brand of Conrad Hotels & Resorts in the country. The property is owned by SM Hotels and Conventions Corp and is managed by Hilton Worldwide. 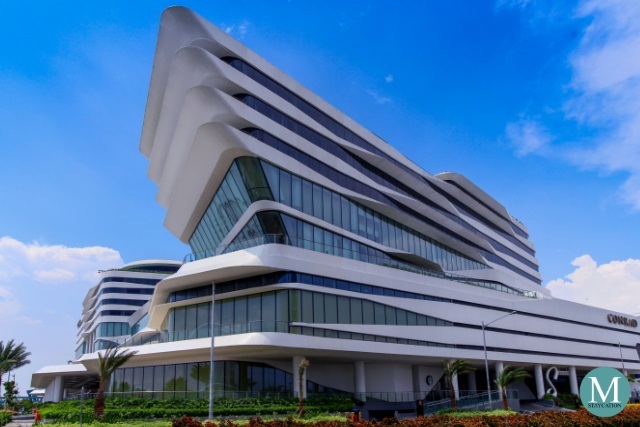 More than just a hotel, Conrad Manila has become a landmark on its own with its distinctive architecture inspired by the shipping vessels that ply the bay. 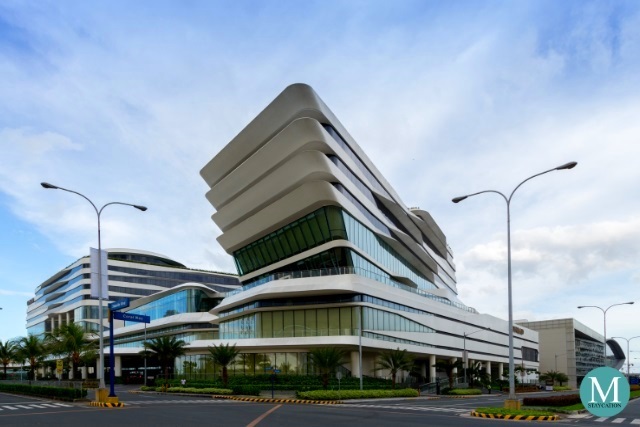 Months before its opening, Conrad Manila has already received several awards such as the Best in Hotel Development, Best Hotel Architectural Design and Best in Hotel Interior Design during the fourth annual Philippines Property Awards held in April 2016. 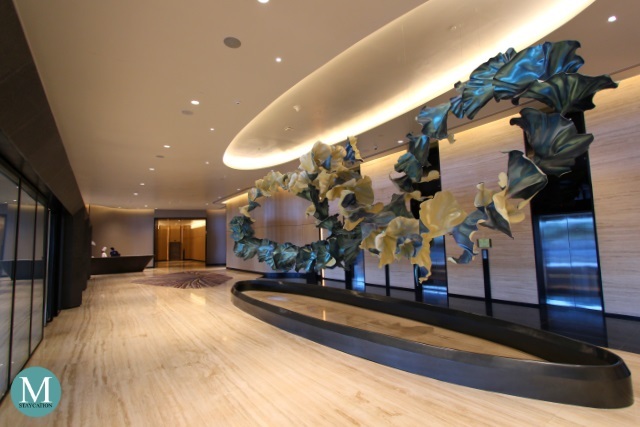 Accessible from Seaside Boulevard is the hotel's welcome lobby where arriving guests will be greeted by a hanging sculpture made by Filipino artist Leeroy New. 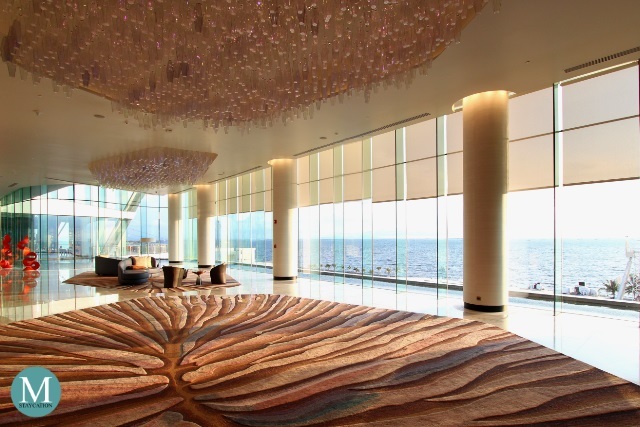 This artwork is said to be inspired by sea plants that bring in elements of the sea into the interior of the hotel. 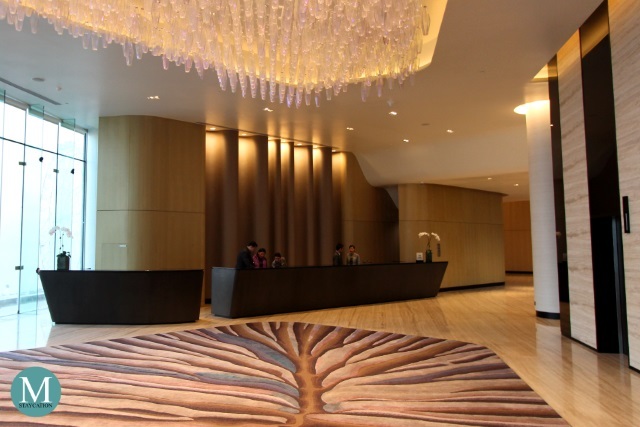 The hotel's reception lobby is located on the third floor. 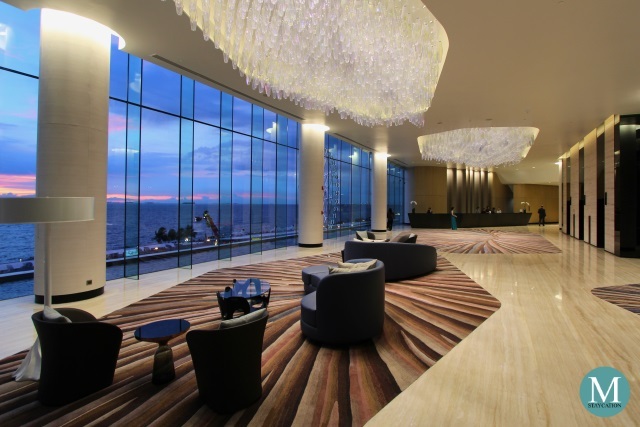 From the elevator, guests will enter the main lobby with its high ceiling and glass walls that provide an astonishing view of Manila Bay. While most luxury hotels highlight their lobbies with a grandiose chandelier or lavish floral arrangements, here at Conrad Manila, the unobstructed bay view is definitely the highlight. Next to the main lobby is the front office where guests check-in and check-out of the hotel. There's also a separate counter for Hilton HHonors members. Check-in was quick and efficient. 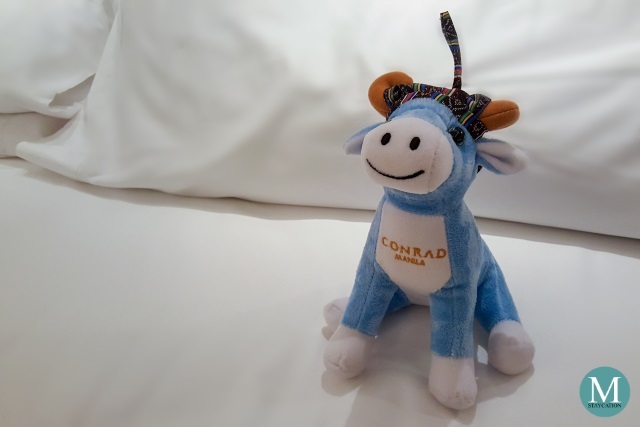 Welcoming us at Conrad Manila was the hotel's Guest Relations Manager who personally showed us to our room. 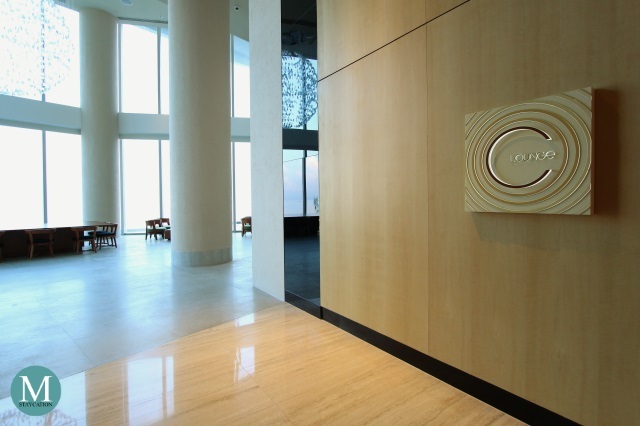 Conrad Manila has a total of 347 guestrooms and suites occupying the fourth to the seventh floors of the property. 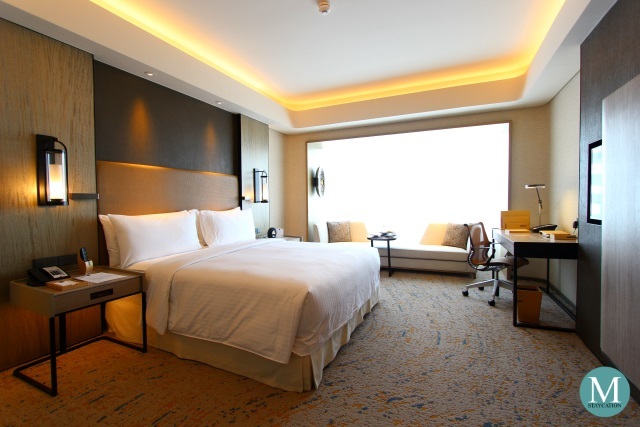 Conrad Manila consists of 4 room categories and 18 room types (check room rates). 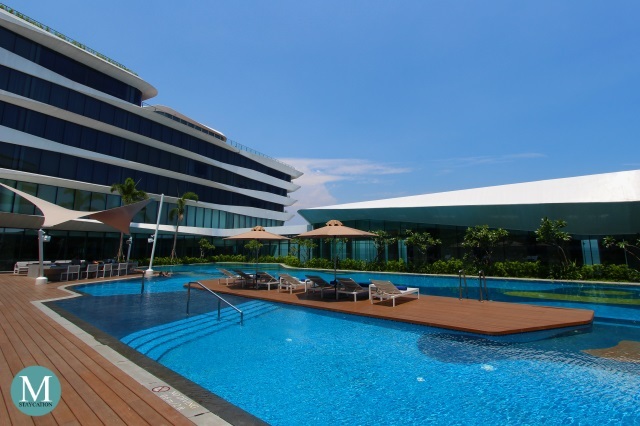 Staycationers will definitely love the Swimming Pool. Designed like a sun deck of a cruise ship, the swimming pool has a tropical resort feel complete with a pool bar and sun loungers. The shape of the pool is inspired by coastal seas of the Philippines with one end overlooking the bay giving that infinity pool effect. The pool has a shallower portion for kids while the 1.6m portion is perfect for morning or afternoon laps. 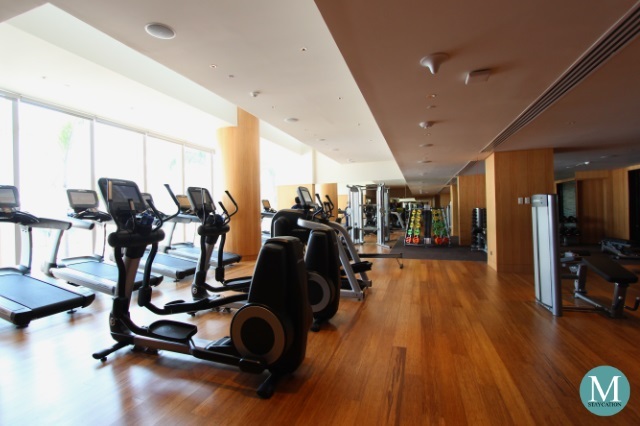 Accessible from the swimming pool area is the hotel's 24-hour Fitness Center. It features state-of-the-art work-out equipment with integrated 16-inch personal viewing screens and access to more than 80 local and international cable channels. A personal trainer is also available to assist guests with their training. For the ultimate relaxation experience during your staycation, there is the luxurious Conrad Spa which boasts of six individual treatment rooms with soaking tubs, private sauna and steam facilities. 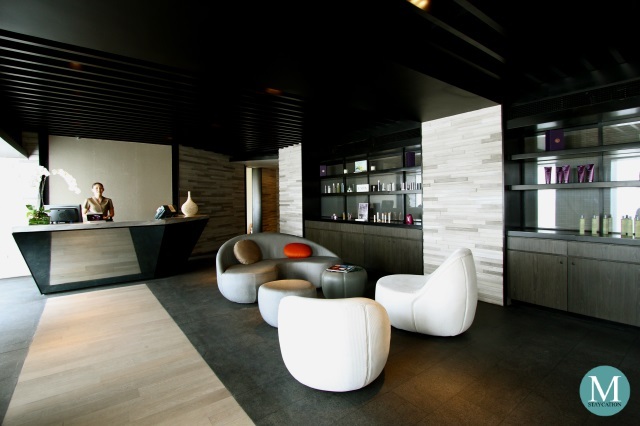 Guests can choose from a variety of locally inspired treatments using organic ingredients. 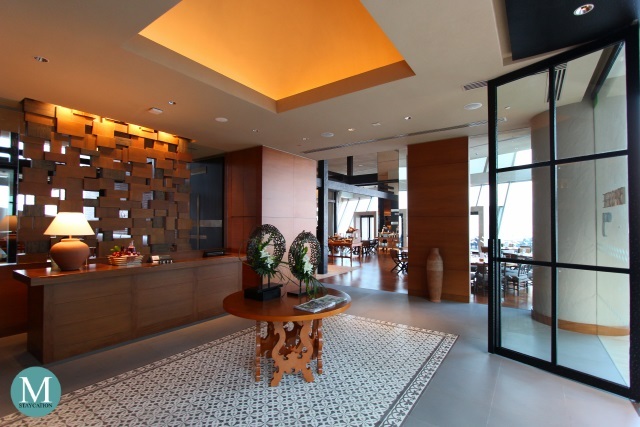 Staycationers will not run out of dining options during their stay at Conrad Manila. No need to step out of the hotel as Conrad Manila features five dining outlets that cater to different tastes and cuisines. 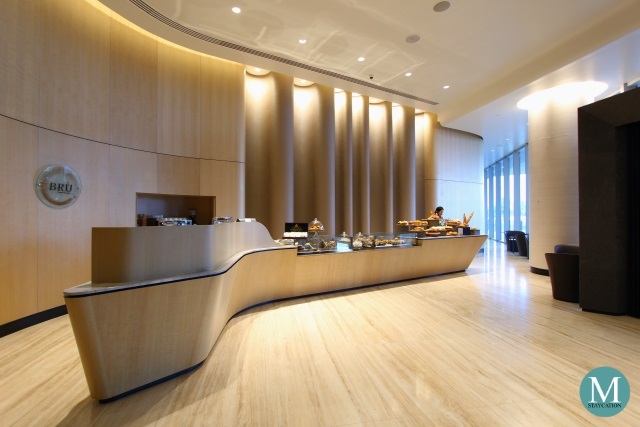 Located on the ground floor, next to the welcome lobby is BRU Coffee Bar offering a wide selection of viennoiserie, pastry items, sandwiches and cakes which guests can enjoy with specialty tea or coffee. Brasserie on 3 is Conrad Manila's international all-day dining restaurant that serves an extensive buffet selection for breakfast and an a la carte menu dining for lunch and dinner. The restaurant features live cooking stations and private dining rooms. Brasserie on 3 is located on the third floor next to the reception lobby. 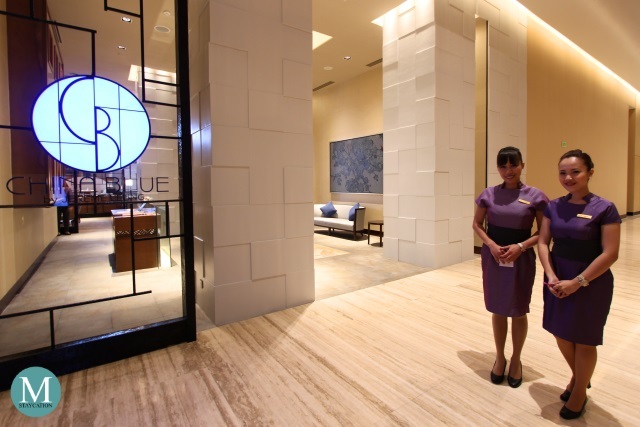 China Blue by Jereme Leung is the specialty Chinese restaurant of Conrad Manila. It offers both traditional and contemporary Chinese cuisine in an elegant and sophisticated, yet warm and welcoming setting. The restaurant also has five private rooms ideal for intimate private dining and business lunches. China Blue is located on the third floor on the far end of the board rooms. C Lounge has the perfect spot to watch the Manila Bay sunset while enjoying coffee or afternoon tea. At nighttime, C Lounge transforms into a hip bar with a laid-back atmosphere where guests can chill on premium rums and signature rum-based cocktails matched with tapas-style dishes. 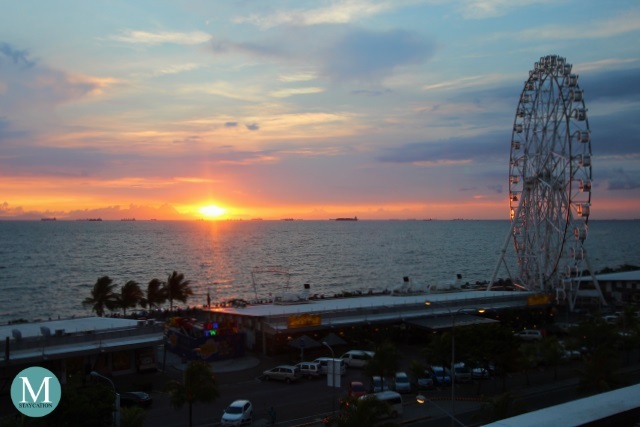 Staycationers can also enjoy the glorious Manila Bay sunset at the comfort of their room if they book a Bay View room category. Make sure that you request a room facing the Manila Bay. If you prefer to watch the sunset in a restaurant setting, you should reserve your table in advance at the C Lounge or at the bay-side tables of Brasserie on 3 or China Blue. 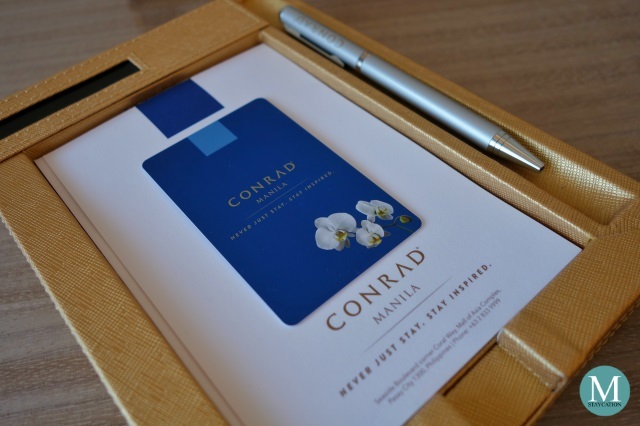 Conrad Manila has a clear edge over other luxury hotels in Metro Manila. It is sparkling new, it has state of the art features, it has astonishing interiors, it has an award-winning architecture, and most of all, it has the best view of the Manila Bay sunset. Coupled with world-class service and excellent food quality, Conrad Manila is definitely one of the best luxury hotels in Metro Manila perfect for staycations (check room availability). Seriously considering this for Father's Day 😀.